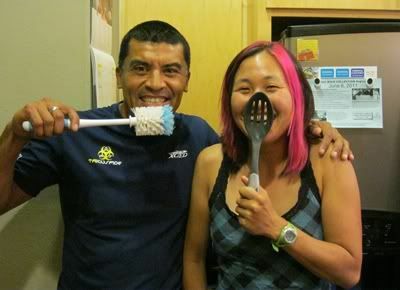 silly photos with Oscar AKA "Big O"
A month’s gone by since IMTX and I’ve moved on. The race report disappeared along with the black cloud that was over my head post-race, and both have been replaced with clarity and new developments in my life that I’m bursting to tell the whole world. Alas, you’ll have to wait. Because suspense makes things extra exciting! But I couldn’t just ignore all the fun pictures I took with my Texas family and friends…My Austin friends had known me long before I was a famous superstar. We were all blogging friends on Livejournal since I started my first blog in 2003. I was a dorky senior in college who had just done my first Ironman (Wisconsin 2002) which holy crap, was a long time ago. It wasn’t quite as trendy and popular to be an Ironman triathlete back then as a 20-year-old so I found friends online with similar interests. 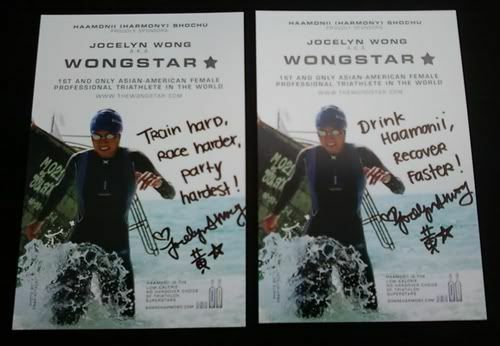 I'm being a mysterious triathlon superstar and throwing out my "Wongstar" gang sign. They knew me before I could break 13 hours in an Ironman (when just finishing one a year was quite a feat, and never mind trying to race one! ), before I ever set foot outside U.S. soil, before I even contemplated the phrase “triathlon superstar.” They knew me before I was even close to hitting the podium…in my age group. They knew me when I didn’t know what I wanted to do with my life. Before there was Facebook and Twitter, they were the first to “follow” me. 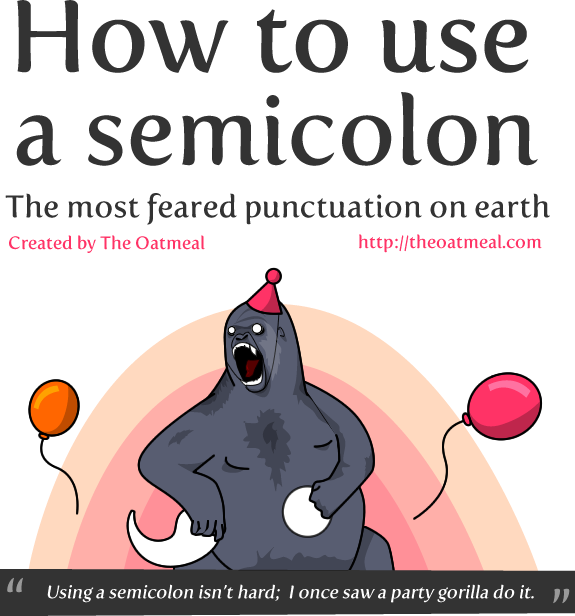 How I struggled to finish my senior thesis so I could graduate from college. 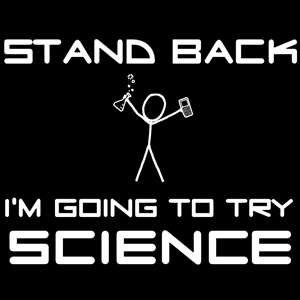 Applying to grad schools. Falling in and out of love. Moving across the country to…Georgia. Then Texas. Choosing a career path. Stumbling through more Ironmans, and brief flirtations with rowing and track cycling. Getting my first email back from teamTBB in 2007 (!!!) and how unfathomable it seemed that I should be chosen to become a pro triathlete. 2007 was when I left Dallas, TX, and the last time I saw most of my Austin friends. It’s just incredible what an adventure the last four years have been and seeing everyone again reminded me how far I’ve come. To have finished an Ironman in 10hrs 50mins, taking 17th in the pro division, and to have THAT be a “bad day” for me–now that was something my 25yo self and the rest of us wouldn’t ever have predicted in our wildest dreams. That and the fact that it was my 20th Ironman finish! It’s been so easy to lose perspective in all of this…so…just wanted to say thank you to everyone who has supported me along the way…with many more adventures to come. Another brisk day with more McFlurries to come tomorrow! 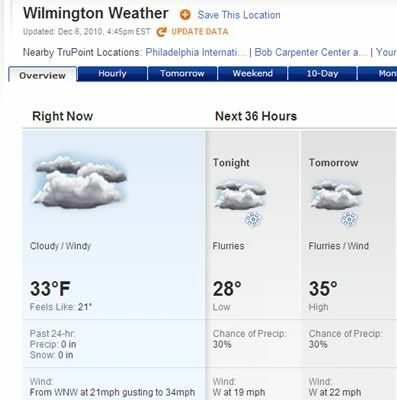 This is what the forecast was when I returned home from my 2.5-hour run outside today. My fingers managed to not break off, which was miraculous. I don’t mind biking indoors whilst catching up to all my favorite TV shows for hours on end, but I’m going to resist hitting the treadie for long run sessions as long as I can! the irony hasn't escaped me that it's frickin freezin and I still want ice cream. In the meantime, here are some non-racing pics from Arizona to enjoy while I keep procrastinating on the race report. I’ll try to finish it while I’m (in line, no doubt) at the DMV tomorrow applying for Delaware citizenship. with Amit from Austin, a longtime fan. we are doing the "WongSTAR" sign. the top 8 pro women. I was 8th in Wisconsin but I don't remember being called up. Then again I don't quite remember if I went to awards. the champs as they play "We Are the Champions"
Me and Mom met Chrissie officially for the first time at awards. Since Momma Wongstar has read every single word ever published on the teamTBB website for the last 3 years, she knew all about Miss Triple World Champion Chrissie. 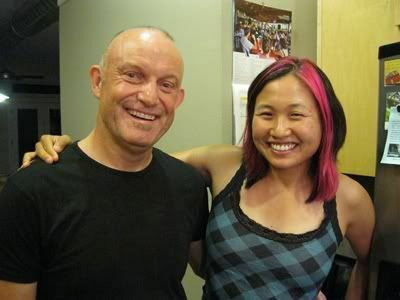 Even though we were on the team at the same time, I never did a training camp with her (my first one was right after she won Kona for the second time and then left the team, so we never had an overlapping training camp). Actually, I guess I unofficially met Chrissie when she passed me 5 miles into the run (she was um, 13 miles into the run) and gave me some words of encouragement along with “we haven’t actually met yet.” But you’ll get that in the race report. 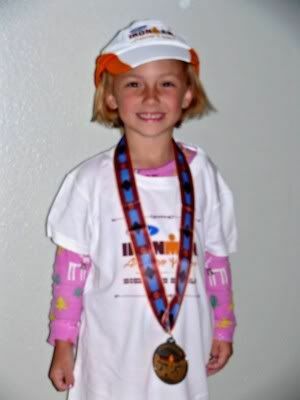 future Ironman Arizona finisher!! she's got 12 years til she's old enough. I’d like to take this opportunity to thank Mr. R and the Ritenours for hosting us in Phoenix. 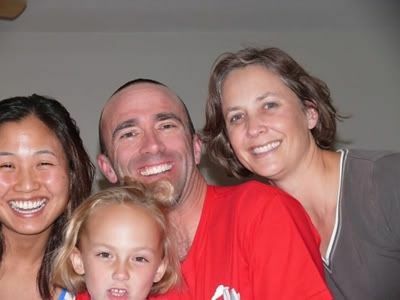 One thing I have loved about “going pro” is that with all the traveling everywhere, I’ve reconnected with awesome friends and mentors from the past. Never thought that I’d get to hang out with my former high school coach/history teacher 14 years down the road!!! We had a great time in Arizona and ahem…maybe I should go do a winter training camp there. how to swim faster in 5 easy steps! So. It happened. I swam faster. It was awesome. It was glorious. I wasn’t the last pro out of the water. I actually came out in front of 5 pro women. And 2 pro guys. I will write out a full race report within this next week but am home for just the next 36 hours for my birthday, I mean Thanksgiving, so I will blog about what everyone wants to hear about most anyway…my swimming! Well last year after a lot of hard work, I got my swim down to a 1:05 at Embrun. But I was also training with Coach and the squad, while overseas at training camps for 7 months out of the year. It is easy to be motivated in a group setting with a scary Australian man yelling that you are weak sauce and throwing water bottles at you while stalking you up and down the pool deck every morning. Yup, that is what Coach means when he says he’s got his foot shoved up your arse at training camps. Well, training camps are expensive for a rookie pro and after racking up some good debt last year, we knew that it wasn’t a sustainable option for me. It’s not like I’m a Chrissie or James, where I can keep going into debt for just another year and then break through and start winning races left and right. I’m pretty in touch with reality (while just a bit out of touch, enough to chase the dream) so I know that I still have some years to keep chipping away before I get there. Now that my season is finally over for 2010, I can look back and get a clearer picture of things. I was initially surprised when Coach had me stay in the USA for the summer, but now I know it was because I needed to learn to do this on my own…without his foot shoved up my arse. The funny thing was that when the year began, Coach told me in Thailand he didn’t care if I didn’t swim faster than 1:05, we should focus on my biking and running as I could make greater gains there. Unfortunately I never came close to 1:05 all year–2010 began with a 1:18 in Malaysia, then a promising 1:11 in China, but got slower and slower until I hit a low of 1:22 in Coeur d’Alene. My swim had a bumpy summer, I trained mostly on my own since I was moving around so much. My average swim split for the year was about 1:16 for the 7 ironmans going into Arizona. It got to the point where I was losing more time swimming than biking or running. Which is totally dumb when the swim is only 10% of the whole race! After Wisconsin, I had a very serious Skype talk with Coach to re-evaluate the plan. It was time to really focus on the swim. Otherwise, “next year will be more of the same.” Now, the only question that remained was, do we start the new swimming plan before or after Arizona? He had me give it a think. The swimming plan meant much more swimming and putting the bike and run on the back burner. My conclusion was to dive right into the swim plan, otherwise “Arizona will be more of the same.” I didn’t want to stay the same. I wanted to get better, to be better. I was willing to sacrifice having a worse bike and run and told him that if I came out with an awesome swim and nothing else, I would still be very happy with my race. How to Swim Faster in 5 Easy Steps. 1. Have faith in your coach. We tried some new things both this year and last year, and learned what didn’t work. Which is part of the process in figuring out what does work. I admit that it was frustrating having my technique experimented with and it seemed that we were starting over at every new training camp. There were times when I struggled not to question what we were doing and times when I felt Coach had given up on me as a swimmer, but in the end, I kept on listening. When there are so many other “experts” trying to tell you to do 100 other things, I have learned to just smile and defer back to The Coach. 2. Swim more, swim harder, and swim with others. There came a point where I felt like I lost a ton of swimming fitness, probably right before Coeur d’Alene. Swimming 2.4 miles alone was actually a struggle. On the new swim plan we embarked on just one month ago, I ended up swimming more than I was biking and running, with more than half of the sessions in a group setting to push me out of my comfort zone. It is hard for me to swim with high intensity when I train on my own. 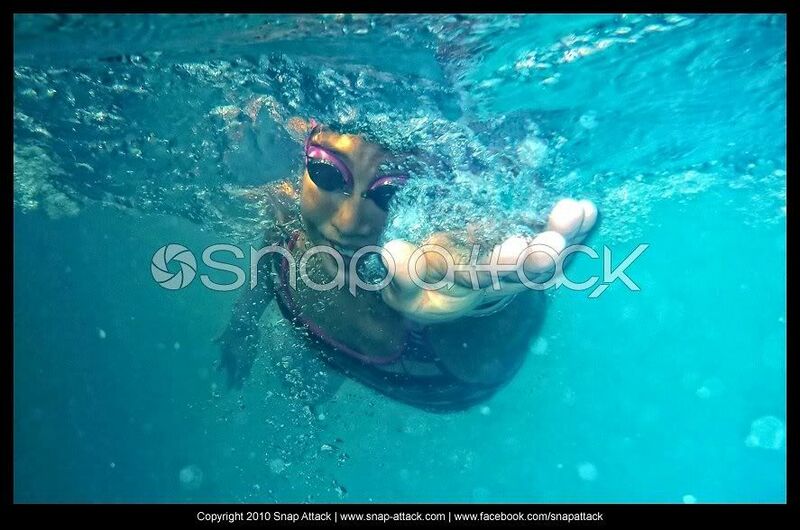 On race day, I ended up just pretending I was swimming with my lanemates Zeke and Mike, and was able to stay on some feet the entire way…without feeling like the swim wore me out! 3. Pray to Grilled Cheesus. Just like the Genie in Aladdin, He listens. I wonder what my next two wishes should be. I’m thinking true love and the ability to eat whatever I want without getting fat. See, Coach had told me it was all about mastering the Jedi mind tricks. He said the one thing I need to work on is the brick wall in my head that says “I can’t swim.” So I decided to shut off my brain each day as soon as I jumped in the water. (I don’t dive.) And just swim. And just swim hard. And not worry about what my form looked like. (More than 3 swim coaches can attest to the fact that when I try to think about correcting my form, it gets worse.) I had to start believing. Believing that I could swim faster. Believing that I could stay on that person’s feet just a little longer. Believing that someday I will have a pro-worthy swim split. I stopped doubting myself, and just went for it. 5. Expand your swimming wardrobe. This was the biggest secret yet! Coach said “Swim like Bella.” He probably meant for me to attack every swim session like Bella, but of course I also interpreted it as “get as many swimsuits as Bella.” Staying motivated in your least favorite discipline can be difficult when you have to swim 7 times per week. But not when you have a superfun and cute outfit for each of those 7 swim sessions! Ok, I don’t have 7 different cute swimsuits yet BUT it is my 29th birthday tomorrow and I am not above accepting birthday gifts from fans. If you want to help me swim faster, you can send me a sparkly new swimsuit to the Bike Boutique in Delaware. Size 32. One-piece. I’ll totally model it here on my blog. I’m not being facetious. I’ve had random fans ask me if I could set up a P.O. Box so they can send me random fan packages without me thinking they are stalking me. Just send it to me in c/o the store and that way I don’t have to tell you where I live. I also accept gift cards from Trader Joe’s and Itunes. yup, happy birthday to me and happy Thanksgiving to everyone else! Don’t forget to catch the Punkin Chunkin broadcast on the Discovery Channel tomorrow at 8pm after you stuff yourselves silly. Hopefully they won’t cut the part where I’m sporting my pumpkin tiara. Happy eating day tomorrow and thanks for all your support! As I’ve maintained the daily blogging streak, I’ve been getting great positive feedback and nobody has told me they are sick of me yet. On the other side of the world, German teammate Christine has told me it’s her daily breakfast reading. So I started to think of it like being a daily comic strip writer, but maybe without the fun cartoons. hey kids, back when I was your age, they printed comics on paper! 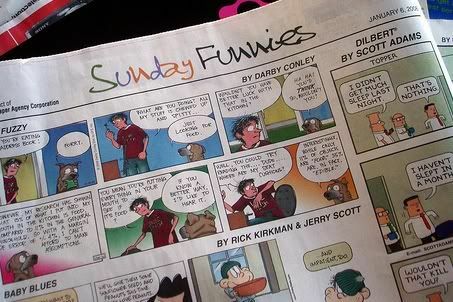 I’ve always had very fond memories of reading the Sunday morning comics growing up with the family. You remember. There were the Saturday morning cartoons and then the Sunday morning comics. My siblings and I would swap pages while we had donuts for breakfast. 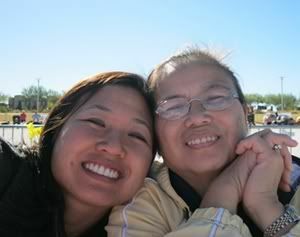 Yep, once a week on Sundays, Momma Wongstar would get us donuts in the morning from the local donut shop, and we each had our favorite donut. Mine was the chocolate one with chocolate icing and shredded coconut on top. I don't know why I Google-image-searched this, now I'm salivating and wanting one. These days since I am always on the go, and even once I get settled in, am too much of a cheapo to buy a real newspaper…and everything these days is online anyway. We have the wonderful magic of the internet for me to get my regular fix of comic awesomeness. Here are my favorite ones. 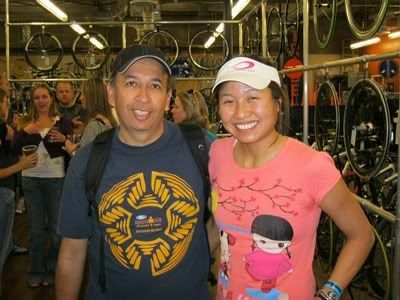 They can be pretty nerdy, just like your favorite triathlon superstar (who is both pretty AND nerdy, AHAHA). Some of the web ones don’t quite run every day so I guess I have a leg up on them. I got hooked onto this one when I was an actual graduate student but it’s fun to still read and think “Oh yeah, I remember those days… so glad I’m DONE! !” I also read that Jorge had completed a triathlon at one point, not sure if he ever did more than one though! Self-described as “A webcomic of romance, sarcasm, math, and language,” the main characters are stick figures and it’s super duper geeky. I recently found out that Matthew is a triathlete (and my age, and kind of hot) and looking to do his first Ironman in the near future. Sweet! He was also featured in the latest Seattle Weekly and apparently made half a million dollars this year just doing his Oatmeal online comic strip and selling shirts and posters of the comics. WHOA. …anyway, as if you don’t already waste enough time foofing around the internet reading my blog and other timesucks, now you have more places to check out. Enjoy! You know I do! Love the Wongstar? “Like” the Wongstar! 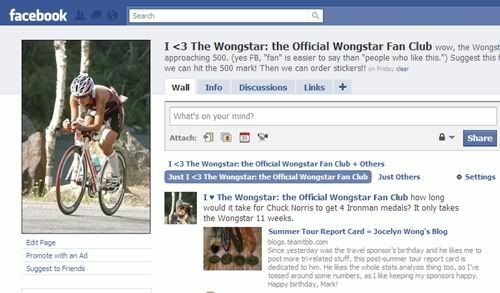 In honor of the new Facebook movie “The Social Network” premiering next Friday, we present to you a very gratuitous plug of the Wongstar’s official Facebook page. 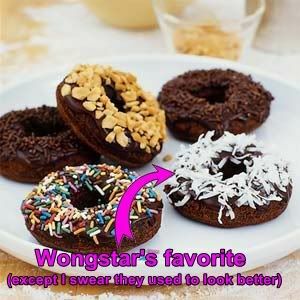 The WongSiSTAR loves the Wongstar, do you? The Wongstar promised her fledgling Facebook fan club that if she hit 500 fans, she would get “I (Heart) Wongstar” stickers printed out. At the moment the fans are just 491 strong, so please visit the page and click the “Like” button. If you already “Like” the Wongstar, she gives you permission and absolutely encouragement to be that annoying FB friend who suggests it to all your friends too! 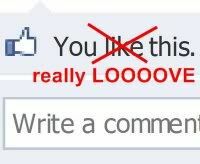 It’s unfortunate that it’s not a “Love” button or one with a heart or “less than 3″ sign (<3). 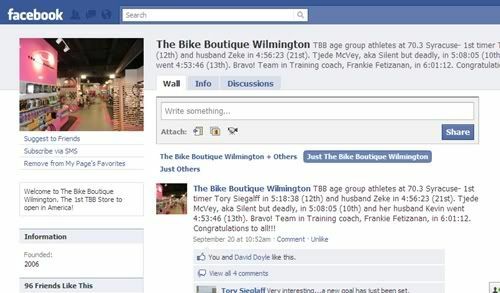 While you’re at it, you should definitely also become a fan of (…I mean “LIKE”…) The Bike Boutique Wilmington, my new local bike shop! Hope you’re having a great weekend! 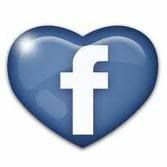 Thanks for “liking” me and any stronger warm & fuzzy feelings you may harbor towards me! You are currently browsing the archives for the fans and stalkers category.